Ukha Fish Head Soup (Уха) is a rustic Russian soup that has been eaten for hundreds of years. Traditionally fishermen cook this outdoors in a pot, over an open fire. While that can be still done today, most of us use an indoor kitchen to make Ukha over a stove. Growing up, I hated Ukha Fish Head Soup for 2 reasons, the fish heads and the fish bones. My grandpa would even eat the fish head, saying it was the tastiest part. I wanted no part of this meal! I also hate fish bones in meat, and picking out small bones. This fish head soup was my worst nightmare. Did I mention the fish heads? 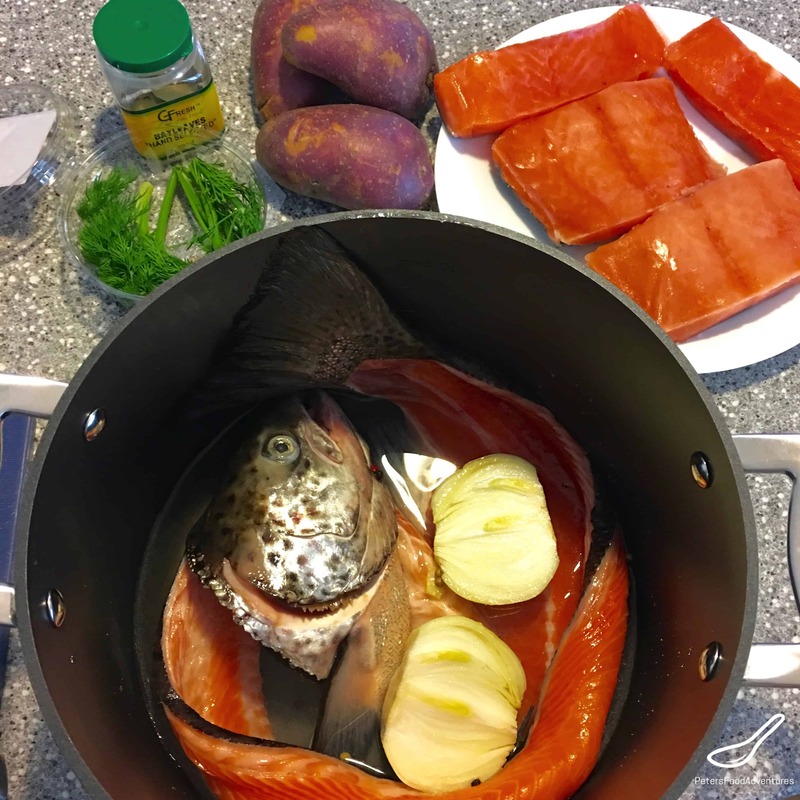 Well I call this my new and improved Ukha Fish Head Soup, where you still get the healthy minerals and vitamins from the Salmon bones, without eating the gross stuff. After straining the soup, the fish meat is skinless and boneless leaving chunky filet chunks of meat that are added towards the end of the soup making process. Leaving a simple, clear and delicious rustic soup. The USSR published a cookbook called The Book of Tasty and Healthy Food (Книга о вкусной и здоровой пище) which was written by Soviet scientists, first published in 1939 then in 1952 which became a staple in the Soviet kitchen. Sometimes it’s referred to as Stalin’s cookbook. There was a recipe for Ukha Soup which I will post the original Russian version at the end of the blog. They recommend using Sturgeon and Perch and specifically prefer river fish, but you can use any fish you like, I like using Salmon and Trout. Ukha Soup is meant to be a very clear broth, as clear as water, without any impurities or floaties. You want to get it as clear as possible. I simply strain the broth using a cheesecloth, however the Book of Tasty and Healthy Food recommends using ground caviar to clarify the broth. I have also heard recipes of using egg whites as well. When it is clarified properly, it is a beautiful looking soup to eat, clear and full of flavor. However, simply straining the soup using a cheesecloth is a great timesaver for me, and it still looks and tastes great! You can cheat and use vegetable broth instead of fish bones, but then it’s not really Ukha, but a vegetable soup with fish. There is a difference. If you only use fish heads and tails, the fish broth will look a bit clearer, as the meaty parts of the fish frame will slightly cloud the soup. My friend Elena throws in a chicken bone with the fish bones for extra depth in the broth. 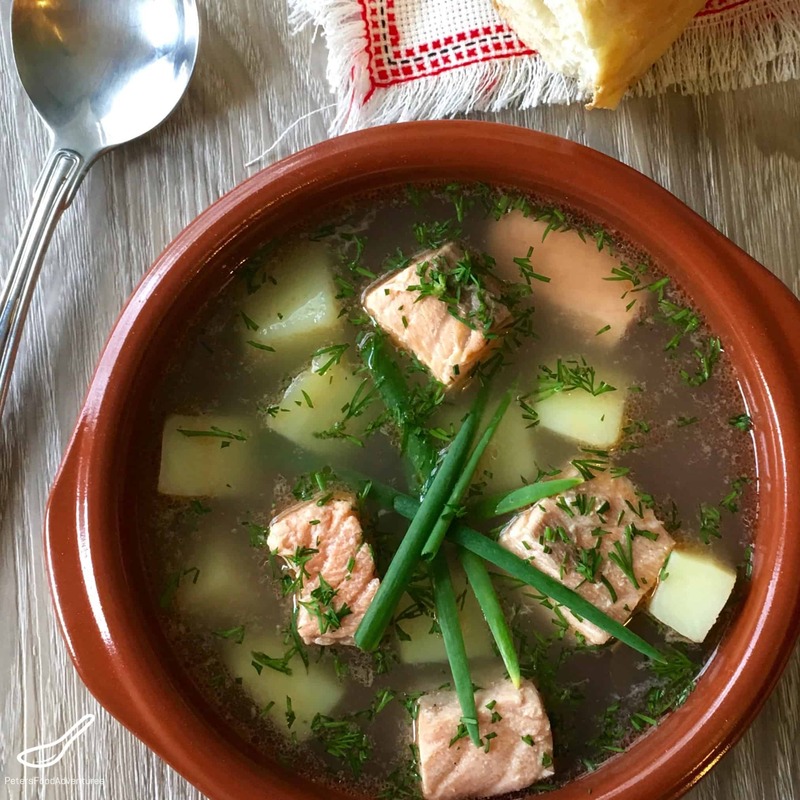 Ukha Fish Head Soup was traditionally served along side with Kulebyaka which is a traditional Russian Fish Pie. I also love the creamy Finnish version of Ukha, which is called Lohikeitto or Finnish Fish Soup. Either recipe, Ukha Fish Head Soup is a delicious way to enjoy a fish soup. Bon Appetit! Приятного аппетита! 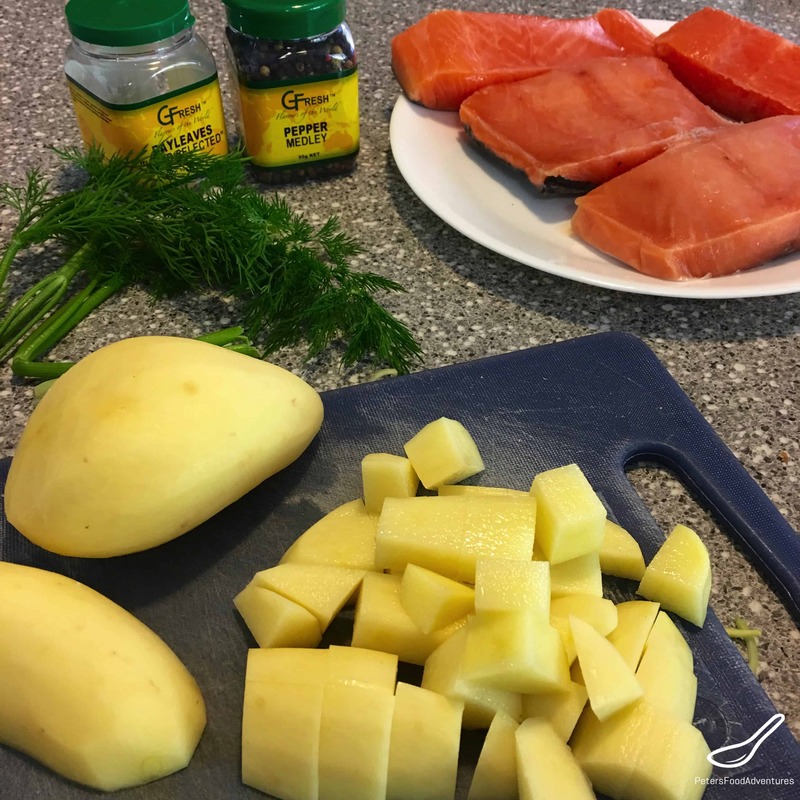 In a large pot, put the Salmon frame and head, the onion, 1 teaspoon of salt and whole peppercorns and bring to a boil. Reduce heat and simmer for 45 minutes. Skim off any impurities. 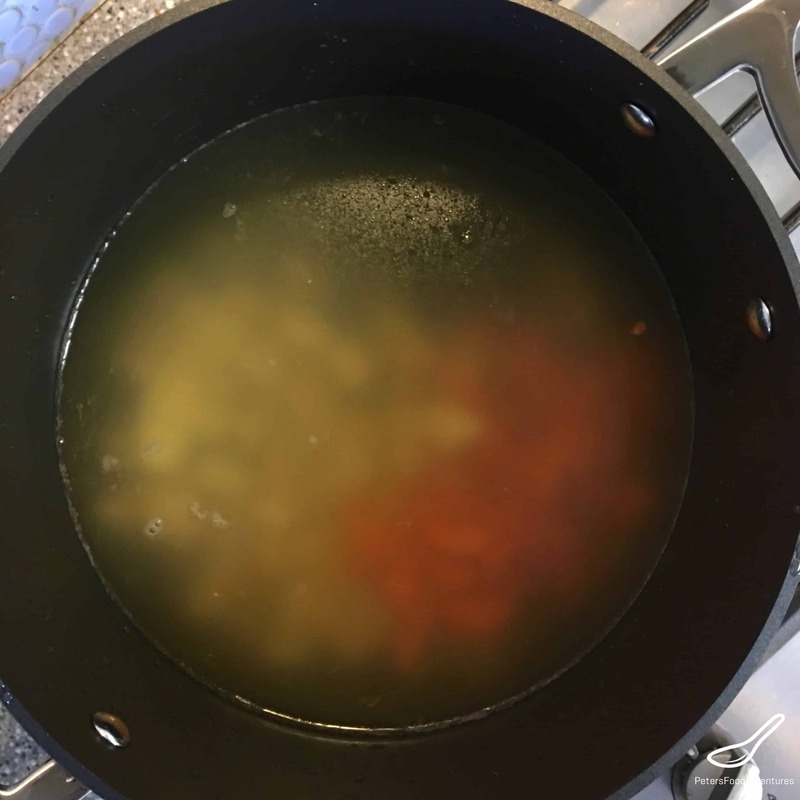 Strain the soup through a cheesecloth inside a colander (over a large bowl) the ensure the broth is clear and free of impurities. Discard the Salmon bones, or give it to your cat. Return fish stock to the pot and add the chopped potatoes and bay leafs. Cook for about 10 minutes, or until the potatoes are soft. Add the boneless Salmon and Trout pieces, which should be cut in 2" cubed pieces. If the pieces are cut too small and thin, they will fall apart. Cook for about 10 minutes. Add chopped dill, season with salt and pepper according to taste. This recipe loves black pepper. Garnish with chopped green onion or parsley. Optional - can add 2 celery sticks and a carrot when cooking the fish stock, as its a taste people like in soups but wasn't in the original fish soups. For additional depth, can add Vegeta Seafood Stock powder for seasoning. My friend Elena recommends throwing in a chicken drumstick into the stock with the fish bones for a richer broth flavour. Наиболее вкусная уха приготовляется из живой рыбы (стерляди, окуня). Уху можно варить также из судака или разной мелкой рыбы, за исключением карася и линя. Для придания ухе необходимой клейкости мелкую рыбу – ершей и окуней – следует варить, не счищая с них чешуи, выпотро шенными, тщательно промытыми. У окуней кроме внутрен ностей надо удалить и жабры, иначе бульон получит горько ватый привкус. Для того, чтобы получить прозрачную уху, надо произвести оттягивание (осветление) паюсной или зернистой икрой. Для этого 50 г икры растереть в ступке, постепенно добавляя по ложке холодной воды, до получения тестообразной массы. Растертую икру развести стаканом холодной воды, добавить стакан горячей ухи и, размешав, влить в два приема в кастрюлю с горячей ухой. После того как будет влита первая часть, уха должна закипеть, и только тогда можно влить остальную часть оттяжки. При вторичном закипании ухи крышку с кастрюли снять и варить при слабом кипении 15–20 минут. Когда уха будет готова, ее надо снять с огня и дать постоять 10–15 минут, чтобы оттяжка осела на дно кастрюли. После этого осторожно процедить. Готовую уху подают с ку лебякой, расстегаем. В тарелку с ухой можно положить ку сок вареной рыбы. На 1 кг рыбы – по 1 шт. репчатого лука, лука порея, петрушки и сельдерея, 2 1/2–3 л воды. Do you allow guest post on your page ? I can write hi quality posts for you. Are the 500 grams of salmon fillet from the salmon frame (where the head and tale came from) or is it an additional fillet bought separately. Thanks! Hi Amy! Great question, sorry if it wasn’t clear. I didn’t catch this salmon and bought the salmon frame separately from the salmon fillets. So if you buy or catch a whole salmon, don’t buy additional fillets for the soup. ???? Wow, thanks so much for the compliment! So glad you enjoyed it! ??????? ?